On February 27, 2010 we lost one of our greatest promoters of the live steam hobby, Robert “Bob” Maynard, in his 91st year. Bob may best be known to the live steam community as the designer of the Clishay engine. This marrying of the Shay and Climax engines was designed and built for Bill Fitt as a birthday present from his wife, Doris. This became a serialized build project in Live Steam Magazine. Bob designed it for the first time builder who had minimal tools available, and it became an extremely popular engine. His building of the model towboat Omar, from riding of the boat, taking movies, measuring the boat, then building a museum model was a measure of his intensity for perfection. Others may remember him best for his fascinating and informative articles published in national magazines as far back as 1950 (or earlier) and as recent as 2006. 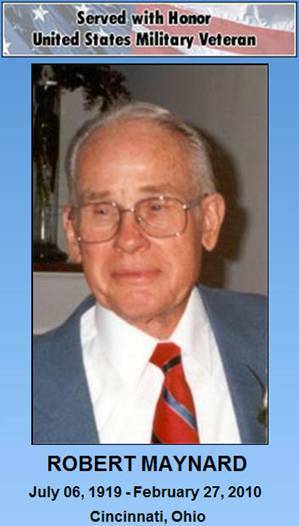 He had over three dozen articles in Live Steam and at least a dozen articles in both Modeltec and Model Engineer magazines, respectively. Bob served as enthusiastic mentor to anyone interested in any aspect of the hobby and as friend to everyone having the pleasure of meeting him. He and his late wife, Ev, traveled extensively riding trains of all sizes. They shared some of numerous trips to ride the Durango & Silverton or the Shays of Cass with friends. Bob, along with five others interested in sharing their love of steam engines joined in forming the Cincinnati Cinder Sniffers club, starting out with a 100 foot oval in Bob’s back yard. Temporary track locations eventually led to the purchase in 1967 of a permanent home in Dover, Indiana. This track was eventually named, the “Bob and Ev Maynard Live Steam Railroad Park” as a tribute to their contributions in instilling their passion of the hobby in countless others. As the current Cinder Sniffers president, Vincent Bradley stated, “Several of us have his engines and they will continue to ply the rails. His influence will be felt for many years to come..” Bob’s contributions in live steam will forever be an inspiration to this hobby. Thank you very much for your donation to the Juvenile Diabetes Research Association. As most of you know, my dad had juvenile diabetes (type 1) since he was around 25 years old. He was quite a famous patient at the local VA hospital. They would bring in the new interns and show him off as a “mystery man”, 60 years plus of diabetes and still going strong. And for those that could attend his visitation, thank you. It felt good for us to have such good friends around and it was a real tribute to our “Bobby”. Thank you all for the friendship and care you gave my mom and dad over the years. I think one of the happiest days of their lives, was when the club surprised them and named the Dover track after them. If you look at some of the photos of that day, the glow on their faces lasted for a long, long time. Notes taken in a conversation with Bob and Ev on Oct 26, 2005. · After Jim's first wife Kathy died, Jim poured his heart into building the B&O 10-wheeler. 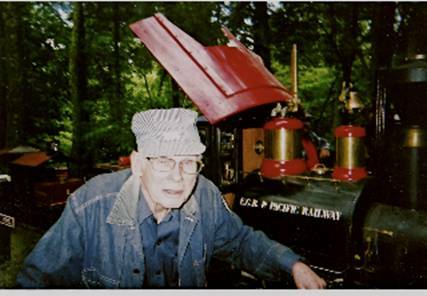 · John Korte called Bob after he read in the Model Engineer that Bob had a steam engine. · The Cinder Sniffers first gathered in 1955-1956 time period. · Another charter member was Ed Biennstein. He was building an LBSC engine. · Jim was the first of our (so far) three treasurers. He served till ~1983. (The other two are Al Lohmoeller & Ed Habel.) Jim left the club a couple of years before he died in Jan 1985. · When hosting monthly meetings, Maynards place was often crowded. · One time there were 63 folks. They were in every room; there was no place where they could all gather. · Besides building McAllister Station & Aull Barn, Jim Aull built the "hammer" to drive the posts into the ground for the South Trestle and drove many himself. · Jim dug the "hole" for North Comfort. 1. Bob refers to the 'flatlands of Kansas' in (Modeltec Feb 1986 p7) as the place where he grew up. 2. Just yesterday, I quickly read through Bob's early articles published in the Model Engineer. Interestingly, three of them are about how he built operating models for his son Greg (as Christmas and Birthday presents). Interesting stuff. A couple of others detail their back yard railroad .... there is a wonderful photo of Father and Son atop two flat cars behind their Atlantic. Note: Clicking the above links will take you to Jim Keith’s web pages. Click “Back” to return to the Cinder Sniffers site. His design and building of the Clishay for Bill Fitt as a birthday present from his wife, Doris. This became a serialized build project in Live Steam Magazine. It was for the first time builder who had minimal tools available. It became an extremely popular engine. The devotion of Bob and Ev to each other, who both had health issues the majority of their lives. Their thirteen or so trips to ride the Durango & Silverton. I have been to meets far away from Ohio and when people found I was from Cinder Sniffers, many times I was asked, how is Bob Maynard? His building of the model towboat Omar, from riding of the boat, taking movies, measuring the boat, then building a museum model was a measure of his intensity for perfection. I first met Bob when I joined the Cinder Sniffers. He and his wife Ev made my wife and daughter very welcome. Over the years our friendship grew and he and Ev talked me into running for president against my better judgment. Bob took a special interest in our daughter Charlotte and under his tutelage she has developed into an excellent engineer. Bob always seemed to be showing or teaching others about his favorite avocation. He like nothing better than to show a newcomer how a steam engine worked from lighting up to shutting down. He was very patient while teaching but he didn’t suffer fools well. Bob will be missed by his friends at Cinder Sniffers. Several of us have his engines and they will continue to ply the rails. His influence will be felt for many years to come and his foresight will ensure that the club is on a solid foundation. Back in the days when Bob and Ev had the red “bug” (VW Beetle) there was a lot of traveling going on, mainly to steam meets. There was the Mid-South meet at Austin Barr’s place in Arkansas, and later Columbia, TN. And then there was Harry Herder’s in Kalamazoo, MI; Bill Fitt’s in Cadillac, MI; John Casidy’s in FL; Clyde Bliel’s in Mentor, OH; NEOLS in Copely, OH; Pershing Scott’s in Iowa, and the list goes on. I had the honor of traveling with Bob and Ev in the back seat of that red bug to several of these meets. Imagine, Susan and related gear in the Dilly trailer in tow behind, three people plus luggage, camera equipment, survival kit and cooler, Ev’s pharmacy and her crutches and the Sunday paper all stuffed into a little car. Everything and everyone had a designated location and position. Because of Ev’s lack of flexibility, her seat was positioned full back and partially reclined eliminating any possibility of someone sitting in the back seat on the right side - so that half of the back seat was filled with much of the stuff mentioned above. I had the left half of the seat. Getting in was something like inserting oneself into a glove. Once in, there was little room to move anything. It was easy to do it then, but there would be no way now. Ev could drive the Bug but it was a major undertaking to make the necessary shifts and adjustments to get her installed in the driver’s seat when traveling under these circumstances. Consequently, on trips Bob did all the driving, and some trips were lengthy. Bob, being 27 years my senior, was more subject to driving fatigue and thereby needed a break once in a while. Because there was a need to get on down the road, and it was out of the question for Ev to drive, and I had never driven a stick, (Bob I doubt was keen on the idea of getting into the back seat anyway) Bob and Ev had a solution which they had devised before I had started traveling with them. To my great concern, needless to say, (this was done on expressways only and when traffic was light - remember those days?) Bob would position his foot on the accelerator to maintain a constant speed and Ev, while Bob put his head back and closed his eyes for a rest, would reach over and take the wheel from the right-hand side and did the steering. If a need for additional control arose, she would call to Bob and he would immediately open his eyes and resume full control. This was done on number of occasions when I was a passenger and I never got used to it. I was figuratively (you couldn’t do it literally) on the edge of that back seat while these events were in progress. Then there was the time Bob, Ev and I went to Cass, WV to ride the trains. Their son, Greg, had been recently married and he and his wife joined us. Bob, Ev and I were in the red bug and Greg and Kathy were in their light blue bug. On the way back home, having started separately, we did not know of Greg and Kathy’s whereabouts - No cell phones in those days. As we were heading north out of Marietta, OH headed for I-70 we spotted a VW on the side of the road with some kind of trouble. It was Greg & Kathy. The engine had developed a problem and was burning oil at a high rate. After putting in another quart, Greg and Kathy pulled out and headed north with us following. We were close enough that after short while tiny oil droplets began showing up on the windshield. Greg pulled over to the roadside again - We were on I-70 now at Cambridge, OH. After a consultation between Bob and Greg it was decided that Greg’s VW would not make it home under its own power. So now what do we do? Bob, leaving everyone by the side of the road, went off to find help. After what seemed a very long time he returned. He reached into the car and pulled out a length of chain and some nuts, bolts and washers. He proceeded to chain the front bumper of Greg’s VW to the trailer hitch of his VW. The nuts, bolts and washers were used in lieu of hooks which were not available where he had shopped. There was about four feet of chain between us. We went back to our respective vehicles, loaded up and headed for home. It must have been an interesting sight to see one bug towing the other. Greg did a perfect job of keeping his vehicle from rear-ending Bob’s when slowing down and making stops. That was about a 200 mile run. Again, I didn’t feel real comfortable about the operation. Bob Maynard did what no explorer ever could. He discovered the Fountain of Youth. As Bob learned, it did not spout water, but steam. Bobby (his wife called him that, I called him that, and his son still calls him that) was the prototype Toys R Us kid. I will never think of Bobby without picturing him in gleaming white gym shoes. It was a symbol that he was able to achieve what we all wish we could - remain young. There was something very Disney about Bobby, his odd vertical boiler engine, and his red Volkswagen bug. I met Bobby in the fall of 1972. I had procrastinated four years in asking if I could visit the club, but from the pages of Live Steam, I felt I knew him. In humility he responded to my letter with “Of course you can come to the club. You probably know more about it than we do”. I approached a guy in a red vest and conductor’s uniform, not unlike a cartoon from the Polar Express, and asked if he had seen Bob around yet. With an asymmetrical smile, he said that he had been seeing him in the mirror for many years. That began a nearly forty year friendship for which I will always be thankful. It is said that you can measure a man by his achievements. I agree. Bobby’s personal projects were always accomplished slowly because he was always helping someone else. That was the measure of Bob Maynard. In 1980, Bobby and I assembled a cardboard mockup of what would twenty years later be his last engine. I had joined Bobby and Keith Watson one day in Knox Shops. Keith told Bobby, “If you build an engine you can ride inside, you will positively wet yourself”. I’m not sure Bobby didn’t. I had a hard time getting him out of the mockup. But when I did, he danced around the mockup in those white gym shoes as a child at Christmas. He danced in those shoes when we dug the roadbed under Bandy Bridge. He danced in those shoes when we put up the highest bent of Taylor Trestle. Through the many adversities he faced, Bobby danced through life. And he taught me to do the same. I struggled hard with the feeling that I was letting a dear old friend down as I wrestled with whether I could take time off school to be at Bob’s funeral. The night before the funeral, I saw Bob in his shop with Jon and Andy and a few of the other neighborhood kids that I often saw around his house. Bobby was wearing those shoes and he was dancing as he saw kids learning. Gruff as he could be at times, he was a born mentor with kids. I knew that Bobby would smile if he knew that I chose to be with my kids that day. You taught me well, Bobby. You guided me in a hobby that has lasted a lifetime, a hobby that has kept me hopeful through so many low times. Thank you. Until I someday join you in the final roundhouse, I will dance. I met Bob and Ev about 30 years ago when I operated The Covered Bridge Inn Restaurant. Bob and the work crew would come in for supper after a hard day’s work at the track. When my son was born, Bob and Ev gave me a special handkerchief for my son's baptism and later for his wedding. In August, he was married and his wife carried the handkerchief. They have a picture of it and the note that Bob and Ev sent him.